You are here: Home / Blog / Cosmetic Dentistry / Review for smile makeover with porcelain crowns in Cancun! When people come to Cancun for cosmetic dentistry they are looking for affordable crowns and alternatives because the dental care price in USA are simple way out of their budget. With our prices, they are able to change their lives by recovering their confidence. We have helped over 5,000 patients from USA and Canada. Scott was one of them and he’s very happy with the results of his dental work. 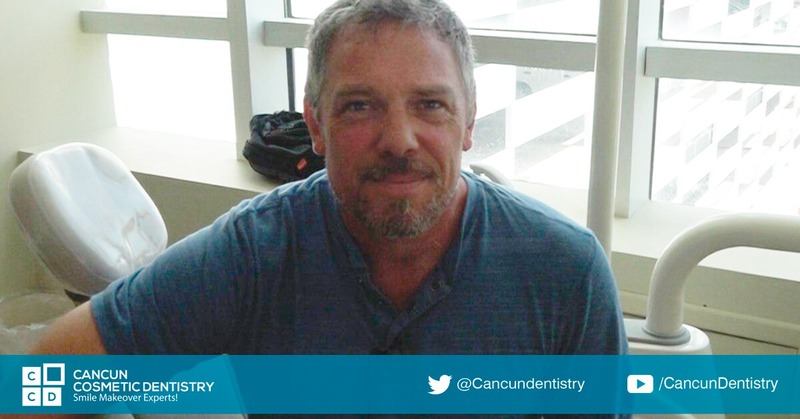 Check what he has to say about his experience at our dental clinic in Cancun. Hi! My name is Scott Kittleson, I’m from Hornby Island which is a small gulf island off of Vancouver Island in Canada… near Vancouver. I’ve been following Doctor German’s clinic for a number of years. There was some dental work that I knew I needed to get done, so I’ve been following the progress of his clinic and watching the testimonials of people who have been coming here… and finally this was the time to come. I just can’t say enough about both the professionalism here and I’m just looking forward for the end results. It’s been a great time here in Cancun. It’s gone fantastic, thank you very much. First of all I would like to say, welcome to Cancun Cosmetic Dentistry. If you are even kind of maybe thinking about coming here, just do it! I tell you what, the savings that I had were such that with that one, ONE, implant paid for my trip: flight and a week of an all inclusive. The staff here are absolutely amazing, they are so friendly, they are so helpful, feels like you are working with a team. There’s people specialized on root canals. There’s people specialized on implants… and, it’t not like you are working with one person. Everyone knows your case, everybody talks with each other. I went from having a terrible bite and cracked teeth and now… I have these! And I had 4 implants, 3 root canals and 16 crowns put in and is absolutely perfect! Amazing case of Smile Makeover! !